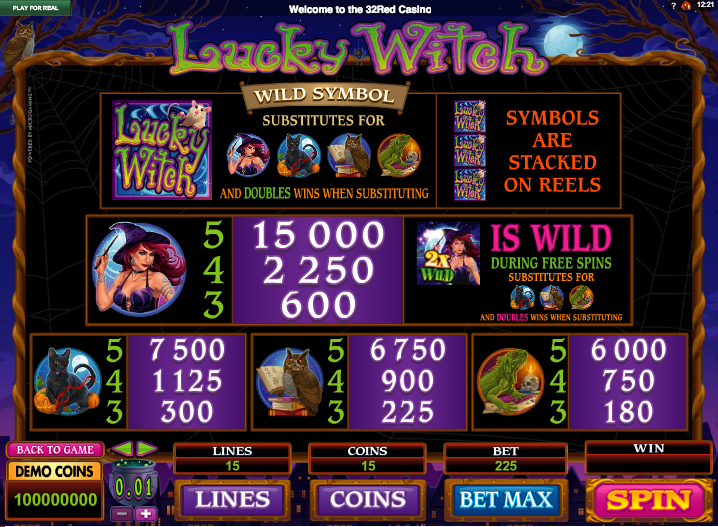 With Halloween just around the corner it’s an appropriate time to have an in-depth look at Lucky Witch, the spooky online slot from Microgaming. As well as pumpkins and witches, it features a range of spooky symbols and several bonus features for those who like a little extra. Lucky Witch is a great looking game set against a backdrop of a full moon, a dark night and leafless branches framing the reels. All the symbols are theme-related and so we have pumpkins, crystals, potions, a spell, a gargoyle, a lizard, an owl and of course a black cat. 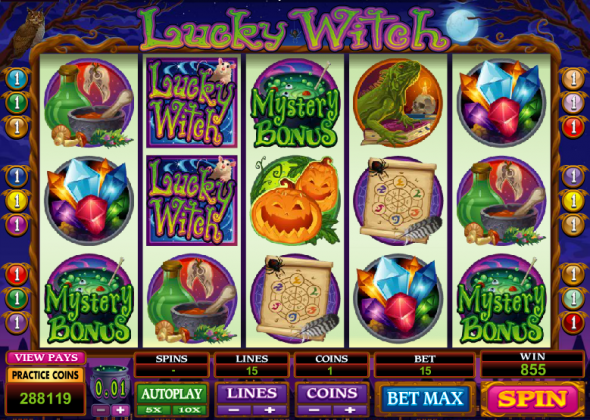 The witch is a the wild symbol during free spins and the Lucky Witch logo is wild during the base game; the blue potion scatter triggers the free spins and the bubbling cauldron is the key to the Mystery Bonus games. You might expect a free spins round from a Microgaming slot and you won’t be disappointed; there of the blue potion scatter symbols anywhere on the reels will grant you thirteen (unlucky) spins. This feature can be re-triggered from within the round and it’s also possible to activate the Mystery Bonus from here. 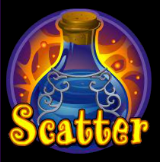 Magic Potion Bonus Game – you are presented with 12 bottles and must pick them until you reveal the “Stop’ one. Until then each bottle is worth a prize amount and there’s also a ‘Win All’ bottle. Pumpkin Bonus Game – five pumpkins appear on the screen and you must choose one; if you accept the prize offered that’s the end of the round but you can reject it and pick twice more if you wish. 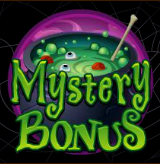 Spell Book Bonus Game – three books are shown and you can pick one to reveal a multiplier which be applied to your total bet. Secret Vault Bonus Game – you are shown twelve vaults and the values and these are then mixed up; pick three and the rest will display their values and disappear. Now pick the one vault you think contains the larger amount as your prize. Firstly, keep the sound on for maximum spooky effect; next, increase your stake within your comfort zone so you can take advantage of the bonus features should you trigger them. Lucky Witch is a great game to set the Autoplay, sit back and just watch the reels while enjoying the creepy music. Loads of bonus features will cheer anyone who likes all the bells and whistles.